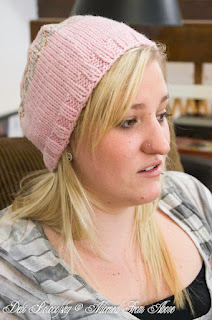 When Diana from Diana Rambles asked me to do a guest post, I immediately thought of this new Pink Hand Knit Hat Pattern. I had just come back from my Antarctic cruise where I made this hat, and I thought that this would be a fun and easy project to share with all of you. I realized when we were on our cruise that I was going to need a knit hat when we went hiking in Ushuaia, Argentina. I, of course, had yarn with me, so I didn't have to buy a hat, I could make one. This is a pretty simple hat pattern, and it is knit in the round on circular needles. 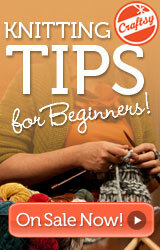 Cast on 88 stitches and do not turn, place a stitch marker and knit in the first cast on stitch. Make sure that your cast on stitches are on the needles straight and all facing in the same direction. You have already k 1 in the first cast on stitch, k 1 in the 2nd cast on stitch, then p2, k2 around the rest of the first row. Reducing stitches for rest of the hat. Thread yarn on a Large eyed needle and draw through all stitches on knitting needle twice. Next take stitches off needle and tighten the yarn and then tie off. Use the needle to weave in any loose threads or you can also do this with a crochet hook. I prefer using a crochet hook to weave in loose ends. 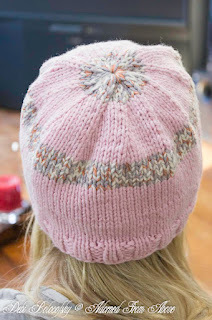 I hope you like this hat pattern. It is a pretty simple pattern. It was fun to be able to wear also. I always love hearing from you, and if you have any problems with the pattern feel free to contact me. You will knit in the pink for about the first 3 1/2 inches, then switch to your different color for about an inch, then back to pink for about 3 inches, and then finish with your different color. The hat will be approximately 8 to 8 1/2 inches from top to bottom. This is a pattern where you could put the different colors anywhere you want. You could even do more rows, just keep your measurements to 8 or 8 1/2 inches. I keep the hats a little big so that I don't have such bad hat hair. 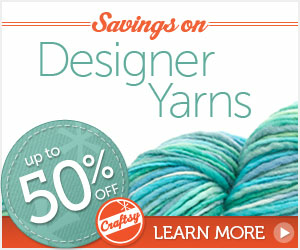 Craftsy offers Knitting Supplies and Classes. Here are so different options that might help you out. Adorable hat! Thanks so much for serving as a guest on my blog this week! Thank you so much for the opportunity to do a guest post. This is my first. Have a great vacation. Hi Debi! I'm visiting over from Make it Pretty Monday. I love your hat pattern. I just learned to knit a couple of years ago and haven't picked up my needles in a while, but seeing your hat makes me want to go grab them. It turned out really pretty. I'm sure it was just the thing for the cooler weather. Hope you're having a great week! LOVE LOVE LOVE the hat!!!! The colors are soooo pretty too!! Thanks so much. I really appreciate it. Thanks for the party. Have a great week.